Why not print a few out and hand them to your friends? 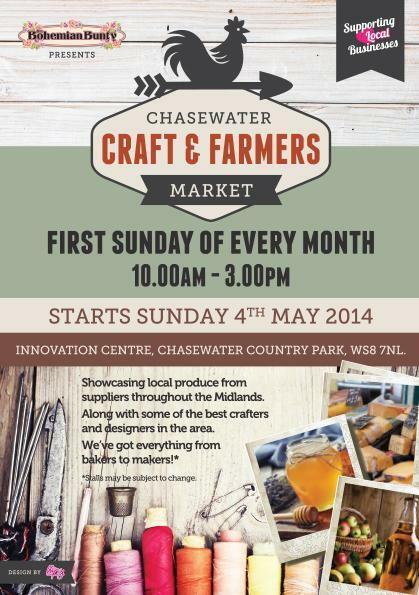 Just a quick heads up that today, Sunday 1st June 2014 sees the second regular Craft and Farmers Markets staged at Chasewater – the first was well attended and garnered a positive reaction. It’s certainly worth a visit. The event is being staged by a company called Bohemian Bunty, and will take place on the first Sunday of every month, the next being Sunday, 10:00am until 3:00pm near the Innovation Centre. You can visit the event Facebook Page here. We have been very fortunate to host this new event at Chasewater Activity Park. We will have local craft and produce traders bringing you the best local and fresh produce, from bakers to honey makers, fresh meat produce, vegan and vegetarian suppliers, cheese makers, florists, holistic produce and artisans of handmade craft bizarre. For traders wishing to trade Please feel free to contact us. All you need is your own gazebo (no bigger than 12 x 12 ft) and the relevant insurances. At our farmers market and handmade craft fair. This entry was posted in Brownhills stuff, Chasewater, Environment, Events, Fun stuff to see and do, Local media, News, Reader enquiries, Shared media, Social Media, Spotted whilst browsing the web and tagged 2014, 4th May, Bohemian Bunty, Brownhills, Chasewater, Country Park, Craft, Events, Facebook, Farmers, Lichfield, local blogs, Market, Reservoir, Staffordshire, Sunday, Things to do, WS8 7NL. Bookmark the permalink. 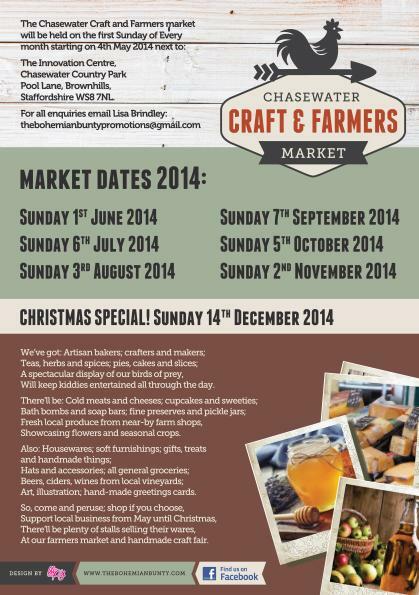 1 Response to Craft and Farmers Market at Chasewater today! Went a walk over there today, great day for it, bit dissapointed, more craft than produce, but got a jar of lemon curd and rhubarb cake, so not all bad, early days, lets hope for more varied stalls next time.